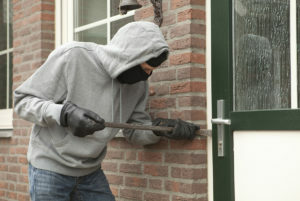 Vandals and thieves damage your home both while breaking in and during their destruction of one of your most valuable assets – your home or business. It is devastating when you come home to find out that you have been burglarized or your home or business has been vandalized. Fortunately, your homeowners insurance policy may provide coverage for many of the different types of damages to your home caused by vandalism or theft, and you can submit a vandalism insurance claim or theft insurance claim to your insurance company. First, damage is usually caused to the point of entry of the vandal/thief which is usually a window or door. Second, any destruction of your property caused by the vandal or thief may be covered by your homeowners insurance policy. Lastly, your stolen property may be covered by your homeowners insurance policy. Depending on the type of property that is stolen (i.e. values, jewelry) your homeowners insurance policy may provide only limited coverage unless an additional endorsement is purchased. Vandalism insurance coverage and theft insurance coverage may also be available in your commercial insurance policy. In such case, the commercial insurance policy may provide additional relevant coverages such as loss of business income or business interruption coverage. Moreover, the insurance policy may provide additional coverage for emergency or temporary repairs to secure the building such that no one can enter through unsecured windows or doors. Makris & Mullinax, P.A. is a Tampa Bay insurance claim law firm specializing in homeowners insurance claim and commercial property insurance claims, including vandalism insurance claims and theft insurance claims. If you experienced damage to your home or business caused by vandalism or theft, please contact us promptly for help. If your insurance company is delaying your vandalism or theft claim, denied your vandalism or theft claim, or underpaid or low-balled your vandalism or theft claim, contact us today.